Brand loyalty can be pretty fickle. Marketers often overestimate the motivations of their brand loyalists and how prominent their brands are in their consumers’ lives. This is particularly apparent when more than half of all grocery items are sold on price promotion. We train consumers to buy our brands on deal and then wonder why we have so many brand switchers. To exacerbate the challenge, many categories feature very little difference across competing products, making it even easier to substitute brands. Very few consumers are exclusive to any one brand in a category. Most consumers shop a portfolio of regular brands depending on what meets their needs at the time. This dynamic has led to very different points of view in the marketing community. Kevin Roberts from Saatchi & Saatchi describes the goal of marketing as the creation of “loyalty beyond reason”. Marketers should focus on creating more brand loyalists and “brands that create an intimate emotional connection that you simply can’t do without. Ever”. I’m interested in your thoughts on how much effort marketers should invest in growing brand loyalty. Here are a couple other cartoons I drew on this theme, in 2005 and 2007. If you improve their life, humour, enjoyment in any way or give them back the gift of time or improve their status or give them something they can be first with if they are an Early Adopter like me, then you might enjoy some brand loyalty. Otherwise you are a box or a bottle on the shelf. 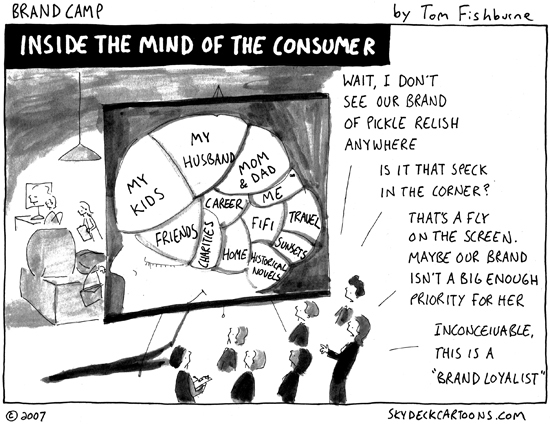 Hi Tom – far too often marketers talk about the concept of brand loyalty as an absolute; consumers are loyal or they’re not. In reality it’s a spectrum. At one end are those people who will put a brand in their shopping cart without thinking, ignoring any deals or offers. At the other end are the consumers who are totally dollar-driven. So marketers should be thinking more about the degree of loyalty, and trying to move more consumers up the spectrum. The other concept to consider is the degree of consumer involvement in the category. Beauty products, for example, generally have a much higher degree of brand loyalty, certainly stronger protection against private label. Categories like these are much more about the brand and less (but not totally) about the dollar. Brand premiums are all relative – if everybody’s on offer, the relativity should still be there. I agree with Tessa. The brand needs to be present at touch points which matter the most to the consumers and enhancing their experience there. For eg. A brand making my long commute to work easier/household work less cumbersome/phone battery last longer! Loyalty might be a thing of the past, so continuous presence has become key, as against spikes in communication and engagement. This does lead to heavy spending, but in a world where brands are battling for higher affinity, it seems necessary. Having read “How Brands Grow” I agree with the sentiments that increasing the base of “light” users of almost any brand would move the needle more than a “loyalty programme” which in most cases isn’t really about connecting with consumers and driving loyalty on the surface or emotional levels. Never have believed much in the idea of “loyalty beyond reason”… Not sure you can really measure it, anyway, so I’m not sure you can every really claim success at it. All that being said, if a brand thinks, plans, makes decisions based on how to earn loyalty, it can’t hurt! A brand on my mind is Hyundai. I bought a Santa Fe two years ago and I love it. Five years ago I would have laughed at you if you said I would be driving a Hyundai. What changed? It started when I read about the Hyundai CEO’s approach to building better cars. He started with the 10 year warranty then told manufacturing not to bankrupt the company by building under-performing cars. That was gutsy but it got right to the point – Total Cost of Ownership for 10 years. I have to be honest, I like the styling of the BMW X5 and the VW Touareg a bit more. But my Santa Fe performs every bit as well – including in the snow storm we just got here in New England – and I love that I am paying almost half the cost of the other vehicles! Now I have to get my wife out of her 328xi and into an Azera or a Sonata – after three years, every trip to the dealer is another $1,000 or more! Creating loyalty means offering something people have a reason to seek out. This is usually expressed by a price premium (something they’ll buy even when it’s not on sale, or when a competitor has a a more attractive offer), but not always. Most brands/products simply aren’t that differentiated, so others are perfectly good substitutes. If the Trader Joe’s in my town closed, I would drive to another town for it. Not so with the local (struggling) supermarket chain, but price isn’t really the issue. Relatively little effort seems to be focused on creating and maintaining the kind of brand/product people will seek out. In my CPG days, we seemed to spend most of our time and money chasing marginal volume: the 10%-15% that would make or break our plan. Yet the brands I managed that had something genuinely different to offer fared far better. Coincidence? Um, not exactly. I represent a sugar manufacturer that has been in business for over 100 years. Bottom line is that sugar is a commodity. Without customer loyalty, the brand wouldn’t survive. Period. Our customers are very passionate about the brand, but it doesn’t hurt that we regularly drop coupons. We cultivate a community of bakers and encourage them to convert their followers too. Brand loyalty does still exist. You just have to find a way to tap into it. I do believe in the concept of brand loyalty but it definitely has limitations. In some categories, consumers may be extremely loyal (think Jordan brand sneakers to sneakerheads) but those same consumers may not develop “emotional connections” in other categories. But where I think a lot of marketers get into trouble is that they mistaken believe loyalty is forever. Brands should really be focused on borrowing customers rather than owning them for a lifetime. I’m guessing that most people who read this don’t still shop at or eat at the same places they did when they were in high school, people grow at change but it’s a mistake for your brand to try to grow with them. I think Abercrombie & Fitch does a good job with this. When I was in high school, wearing Abercrombie was a badge of honor, but in college no one wore it. They stick to their youth demo very well and I think that’s one reason why its been so successful. Perhaps a different perspective: how often do we mistake “routine”, “habit” or “familiarity” for “loyalty”? Even for things that are truly a commodity, I know that I will tend to stick with the familiar over something different, even if it means paying more. In fact, I really don’t even pay attention to the price. I probably couldn’t tell the difference between any two mainstream ketchup brands, but I put Heinz in the cart without a second thought. When I need ketchup, I get Heinz. Pretty much any laundry soap will do the job, but when I need some, I grab Tide and don’t even bother looking at the other brands. It’s habit. I know it works. If either of those products stopped working for me, then I’d consider something else. But until then, I go with what I know. I’m pretty sure that neither of those two innocuous products are materially any better or worse than their competitors. But I pick them anyways. If either of them disappeared from my usual store, it isn’t like I’m going to go hunting around to find them elsewhere. But while they are available, I get them. Is that loyalty in any meaningful sense? I’m not sure. We are only really loyal to brands that give us something extra, additional to the product or service experience… When we think the brands we (want to) associate ourselves with make us (look) cool to our neighbours, friends and co-workers. Like certain tabacco brands associating very succesfully with adventure. For all cars the expected operational cost per mile can be calculated to the penny, but why do some of us rather buy the more expensive cars or wish we could…? I think the whole concept of ‘bought’ loyalty, through discounting or points schemes, is old fashioned and consumers are tired of it. Brands have to switch the question on themselves and instead of asking – ‘how can we get our customers to be more loyal’ they need to ask ‘how are we showing loyalty to our customers’? They need to provide advice, impartial guidance, useful services, tools or entertaining experiences. They need to add value through values and community activity rather than just a kickback to wallets. Creating true brand loyalty means the brand has to give without any guarantee of receiving. If you want people to like you as a person, be nice to them and show them love. The same logic extends to brands. That means defining a clear set of values and personality, something which many brands struggle to do with any authenticity. The bottom line is, if a brand isn’t prepared to show genuine loyalty to it’s customers, then why should it expect those customers to show loyalty to the brand? Customers that are ‘bought’ will be just as easily bought off as soon as a better offer comes along. As a consumer, I can see the point here about how I do substitute brands when they have deals. And also that some deals just won’t make me switch because my current brand has always given me what I want at the right price for me. As a marketer, I work in entertainment and technology, which has a ton of passion around it. That passion inspires people to follow brands, talk about brands, and be a part of their life (less consumable, more functional and fun). And it does create a true community. This actually leads to a network affect where these consumers are loyal themselves but also to their network, making them very sticky. 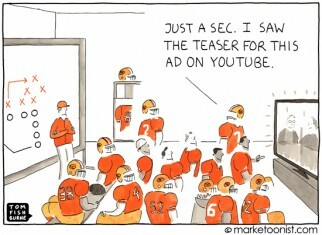 Great for a leading brand, and more challenging to break that habit when a challenger. Great points by Tessa and GK. As a consumer, I go to the brands that I know are “safe” for me to eat because they seek the certifications that they are gluten free (I have celiac disease) and label every possible ingredient. I don’t often stray from them because to do so means taking an unnecessary risk to my health. Am I loyal, though? Not exactly. I flirt around a few brands that I know do the same things and I’m not above trying a new brand that’s got the certifications necessary. As a marketer, I firmly believe that we have to have a quality product and build our marketing around the facts, engendering a sort of loyalty around the quality. If that happens, then the “loyalists” will come. Kevin above mentioned the article about the different types of loyalty – I personally find the “heart loyalists” a little scary. I don’t want them to spout off personal missives about the Gods of the company, I want them to go and tell the world that my product rocks. 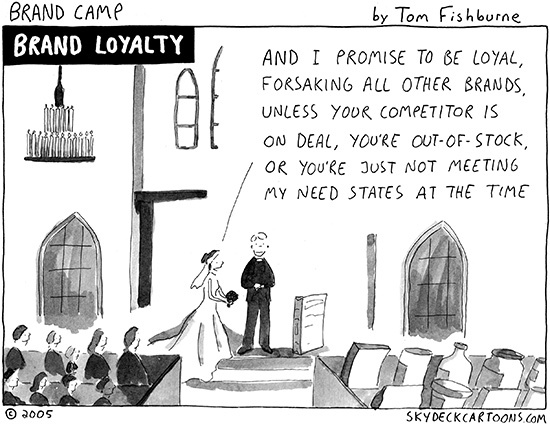 I think marketers think about loyalty completely the wrong way round. I believe brands should show loyalty to their best customers by giving them additional value because these customers are typically much more profitable. Yet many brands offer better deals to new customers in an effort to woo them from competitors. Guess what, if we show loyalty to our best customers they will probably reciprocate by staying with us. What goes around often comes around. Good and especially timely for me because I’m in the process of bring a new product to market and was concerned about brand loyalty. Thanks for the insight. 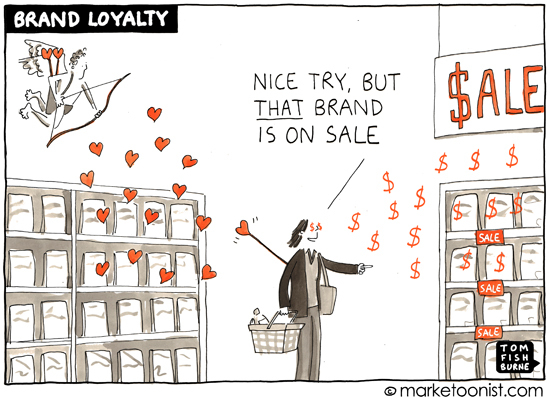 Brand Loyalty Today… The “80” customer typically cares less about the brand and more about the price. The sales channels today are drastically different than 10-15 years ago, largely due to internet and mobile technology advances. 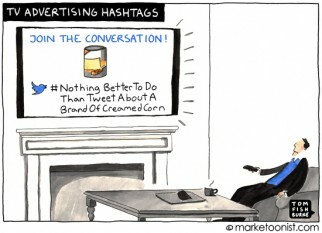 This definitely affects brand loyalty but more so on commodity products and services. It’s hard to get that warm fuzzy feeling about a product when you know a similar product under another brand, at a lower price, will also provide you with that same warm fuzzy feeling! The premium brand will usually get that last look but the justification for premium brands is a moving target! Price vs. comeptition is the new warm fuzzy feeling. Once upon a time I loved Nokia, then I love Apple, now I love my Samsung Galaxy (Phone). I have no doubt I’ll change in future when something else comes along. I and many others will do this with many products/brands over time (be it years or days). Brand Loyalty is only a measurement in the ‘present’ and is very hard to calculate honestly for consumable items. In all my career I have never seen a loyalty metric that didn’t refect a brand’s (recent past) market share. All brands get some loyalty (in line with their share). There’s a big difference between a bottle of Heinz catsup and a Hyundai, and a huge range of products in between. Loyalty doesn’t mean the same thing across that spectrum. I am not sure that Kevin Roberts actually believes what he says. He just says it because he knows marketing directors can fall in love with Lovemarks – and when that happens he has captured their loyalty. I think loyalty is an outdated concept, especially in the new marketing environment that is being shaped by social media. In this new social world loyalty means sticking by someone through thick and thin, not incentivised repeat purchase – brands will never be able to attain this type of loyalty (it is not just beyond reason, it is beyond all possibility). However, brands can create respect – and fundamentally they do this by simply listening to consumers / customers and answering their questions – not by trying to make people love them, ‘Like’ them or even be their ‘Friend’. Bob Hoffman, The Ad Contrarian pointed out this article about how our buying habits change. Most big brands – and even small businesses – do not really focus on what customers want so they are unlikely to get much loyalty. Corporations turn everything into a commodity and since they rarely have decent customer service who cares which one you buy? Kim OQuinn says sugar is a commodity. I wonder if her company realizes the growing interest in buying ONLY pure cane sugar and avoiding sugar made from sugar beets because it is likely to be GMO. Do they know people are sharing tips on how to determine what kind of sugar is in a bag or box? She says they have bakers. Does her company know that sugar from beets performs much less satisfactorily in baked goods than cane sugar and many bakers avoid it? Any company that makes something we eat can create brand loyalty by being ethical, applying REAL Fair Trade principles (not the illusionary kind created by big corps), learning what people are really working to find and avoid (harder than ever with organic standards turned into a joke) and becoming TRUSTED. Search for #buylocal #shoplocal #eatlocal on Twitter and see how much buzz there is surrounding finding REAL food. People like me do not eat packaged chemical laden gmo rbgh radiated microwaved junk (what many of them even call “Frankenfoods”). Any company that can be TRUSTED will get brand loyalty. We pay more for nutritious food. Many of us don’t care if it is certified organic – we want to know where it comes from and how it is grown, handled, packaged and shipped. Read the details on Eden Foods Web site about them testing for radiation to get some idea. As Tracy Carlson said, she would drive to another city to Trader Joe’s if they moved. Same reason. Local grocery stores could create loyalty by carrying what we want that is nearly impossible to find locally. In Texas, many drive 45-60 miles into Dallas or another metro to go to Whole Foods to buy those dozen or so things we refuse to do without: fluoride-free toothpaste, Dr. Bronner’s soaps, Aubrey’s Organic hair care products, Traumed / Traumeel tablets and cream, etc. If they had those items we would not drive to Whole Foods – we would buy everything in THEIR store. Small grocers can’t compete on price so they need to compete to selling what big chains don’t – and then get someone like me to make sure people who want them KNOW they carry them. That means we want locally grown produce, locally raised free range meats, and non-corporate brands of food packaged by companies that won’t poison us to save a penny. Another way to create brand loyalty is by making products of high quality and emphasizing lifetime cost instead of cheapest. I only buy shoes from SAS and boots from Tony Lama and Ariat because they last and they are comfortable and support my feet. THEY have brand loyalty. Finally, great customer service with a friendly, helpful attitude creates brand loyalty. People WILL pay more and drive further to shop and eat where they get great service with a smile. I always do and I am NOT the only person who does. Even price shoppers WILL go out of their way to eat at their favorite restaurant or buy from a favorite shop. That means you give your front-facing employees the power to make your customers happy, you treat them with respect (because how you treat them is how they treat your customers), and you TRAIN THEM to do a great job. Many a small business goes under because they don’t realize how incompetent or useless their employees are while many corporations don’t care or downsize their staff until there is no way they can do their jobs properly. Too bad most companies do not listen to what their customers tell them. With social media, reviews, surveys they really have no excuse. Make it easy for customers and employees to complain anonymously – and then actually hear what they’re telling you. Then go fix it. Before people keep insisting that there is no brand loyalty any more, I want to share some examples of companies that have been around a long time and never lost it: Snapper Mowers and Master Lock. They didn’t go cheap. Snapper told Wal-Mart no. And both products have great reputations and many only buy from them. Many newer companies that have strong brand royalty are related to organic products and food: Aubrey Organics, Arbico Organics, Ark Naturals, Natural Organic Warehouse, Marcal Small Steps, Seventh Generation to name a few. Great brands are so hard to find that I actually have a page I maintain where I collect Recommended Brands. Those are all examples of companies that created brand loyalty – and I would love to add to it. Businesses that understand customer satisfaction needs to be making themselves more obvious online so people like me can get others we mentor and collaborate with to recommend them. This is not an either / or debate.. Our research project, MEC Momentum, across 12 countries with over a 100,000 sample identifies consumers ‘passive’ stage bias and the import on the actual purchase decision. Across categories, passive stage bias, built up by brand availability and presence amongst other things, translates to being on the shopping list, less price sensitivity and shorter purchase cycles. The trigger for purchase plays a critical role. top up or specific need – i.e. bad dry skin. Commodity categories, in everyday shopping situations, as Byron Sharp says, are prey to price promotion. So which brand on the shortlist is on offer? And communications can play very different roles at different points of the purchase journey to help build brand momentum. . See mecglobal.com for more information on MEC Momentum.